Homepage. This page: From the 1950s, an interesting piece of garage kit from Associated Engineering (Sales) Limited. Repairing old pistons using the Koetherizing approach. Dating to the 1950s is this interesting piece of garage equipment, used at AES branches across the UK, and of great interest to any firm involved in the rebuild of car engines. This was a time when many cars were run on a shoestring, and car owners would do whatever they could to eke out a few more miles from their tired old motors. If something could be refurbished, rather than thrown away and replaced by new, then there would usually be a saving to the motorist. 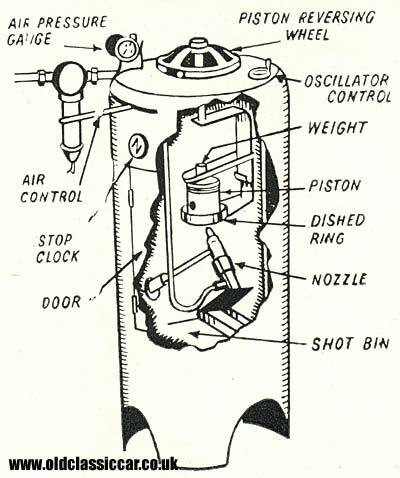 The process was called Koetherizing, which, according to the blurb, had been "proved over many years to be the most accurate and permanent method of re-sizing worn pistons". The apparatus used by AES consisted of a tubular case, into which the piston needing repair was affixed, mounted on a rotating stand. The full process was described as follows: "Koetherizing consists in subjecting certain chosen portions of the inside of the piston skirt to the peedning effect of a controlled shot blast. The produces a hard skin on the parts treated altering the shape of the skirt and expanding it in a predetermined manners, so that when restored to its correct dimension the piston has both the original ovality and taper. It also gives the piston skirt a resilience which is permanent and fully capable of standing up to any temperature likely to be met with in service." AEC could also supply new piston rings to go with the refurbished pistons, so all in all a very useful service. Return to my motoring gadgets, tools & accessories pages at oldclassiccar.